Over the past three decades, I (and my students) have been invited to give many presentations. The topics range from microbiology to pedagogy and the assessment of student learning. Here is a brief list of some of these. Presentations internal to my own institution have been excluded. Franklund, C.V. Enhancing Faculty Engagement in Assessment Using Interactive Reporting. IUPUI Assessment Institute. 2018. Franklund, C.V. Improve Assignments – General Education Assessment on a Tight Budget. Nuventive Users Conference. 2018. Franklund, C.V. Reproducible Assessment of General Education: Systematic Use of Course-Level Student Data. IUPUI Assessment Institute. 2017. Franklund, C.V. Assessing General Education Program Outcomes: Systematic Use of Course-Level Student Data. Nuventive Users Conference. 2017. Bishop, R., C. Franklund, J. Joseph, H. Pavletic, V. Piercey, and T. Williams. Moving the needle on General Education assessment. Association of American Colleges & Universities, Institute on General Education and Assessment. 2016. Franklund, C.V. Facilitating the Systematic Assessment and Reporting of Course-Level General Education Outcomes. Association of American Colleges & Universities, General Education and Assessment: From My Work to Our Work. 2016. Franklund, C.V. Facilitating the Systematic Assessment and Reporting of Course-Level General Education Outcomes. Association of American Colleges & Universities, From Mission to Action to Evidence: Empowering and Inclusive General Education Programs. 2015. Creating Institutional Processes that Enhance Faculty Engagement in Learning Assessment. HLC-NCA Assessment Workshop. 2013. Franklund, C.V. Polio: A Disease on the Brink of Extinction. Big Rapids Rotary Club. 2011. Franklund, C.V. Facilitating Collaborative Learning with Google Apps. Lilly Conference on College and University Teaching. 2010. Woodman, H., C.V. Franklund, and C. Conley-Sowels. Rubrics + Readability = Retention – The 3 Rs: Making the Connection. Lilly Conference on College and University Teaching. 2010. Woodman, H., C.V. Franklund, and C. Conley-Sowels. Rubrics Rock! Using Rubrics to Assess Authentic Student Learning. Texas A&M Assessment Conference. 2010. Woodman, H., C.V. Franklund, and C. Conley-Sowels. Rubrics Rock! Rubistar and Beyond: Rubrics to Use Monday Morning. Lilly Conference on College and University Teaching. 2009. Franklund, C.V. Using Computer-Assisted Formative Feedback to Enhance Learning in an Introductory-Level Microbiology Course. Lilly Conference on College and University Teaching. 2008. Franklund, C.V. Microscopic Analysis of Oral Biofilms. Microscopy Society of Southern California. 2003. Franklund, C.V. Genetic Analysis of Lipopolysaccharide Synthesis in Fusobacterium nucleatum. California State University, Fullerton. 2003. Nolan, D., H. Abdelhadi, and C.V. Franklund. 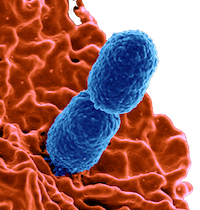 Cloning and Characterization of the recA Gene from Fusobacterium nucleatum 10953. National Meeting of the American Society for Microbiology. 2003. Raps, A., and C.V. Franklund. Cloning and Analysis of a Lipopolysaccharide Core Gene from Fusobacterium nucleatum. National Meeting of the American Society for Microbiology. 2002. Raps, A., and C.V. Franklund. Cloning and Analysis of a Lipopolysaccharide Core Gene from Fusobacterium nucleatum. Southern California Branch Meeting of the American Society for Microbiology. 2001. Krebs, T., C.V. Franklund, and J.B. Goldberg. Function Analysis of Enzymes in Lipopolysaccharide Biosynthesis. Annual Meeting of the Virginia Branch of the Amer. Society for for Microbiology. 1999. (Honorable Mention). Dean, C.D., C.V. Franklund, J.D. Retief, M.J. Coyne, Jr., K. Hatano, D.J. Evans, G.B. Pier, and J.B. Goldberg. Sequence Analysis of the O Antigen Locus from the Serogroup O11 _Pseudomonas aeruginosa _Strain PA103. Annual Meeting of the American Society for Microbiology. 1998. Franklund, C.V. and J.B. Goldberg. Cloning and Characterization of GltX from Pseudomonas aeruginosa. Annual Meeting American Society for Microbiology 1998. Franklund, C.V. and R.J. Kadner. Regulation of btuB in Escherichia coli. Annual Meeting American Society for Microbiology. 1996. Baron, S. F., C. V. Franklund, and P. B. Hylemon. Cloning, Sequencing, and Expression of the Gene coding for 7a-hydroxysteroid dehydrogenase from Eubacterium sp. VPI 12708. Southeastern Microbial Physiology and Genetics Conference. 1994. Baron, S. F., C. V. Franklund, and P. B. Hylemon. Characterization of the Bile Acid-Inducible NADH:Flavin Oxidoreductase Gene from Eubacterium sp. VPI 12708. Annual Meeting of the Virginia Branch of the American Society for for Microbiology. 1993. Baron, S. F., C. V. Franklund, and P. B. Hylemon. Characterization of the Bile Acid-Inducible NADH:Flavin Oxidoreductase Gene from Eubacterium sp. VPI 12708. Annual Meeting of the American Society for Microbiology. 1993. Franklund, C.V., and P.B. Hylemon. Evidence for a Multiprotein Complex Containing the Cholate-Inducible NADH:Flavin Oxidoreductase from Eubacterium sp. Strain VPI 12708. Annual Meeting of the American Society for Microbiology. 1988. Franklund, C.V., and P.B. Hylemon. Evidence for a Multiprotein Complex Containing the Cholate-Inducible NADH:Flavin Oxidoreductase from Eubacterium sp. Strain VPI 12708. Annual Meeting of the Virginia Branch of the American Society for Microbiology. 1988. Franklund, C.V., and T.L. Glass. Glucose Uptake by the Cellulolytic Rumen Anaerobe Bacteroides succinogenes S85. Annual Meeting of the North Dakota Branch American Society for Microbiology. 1986. Franklund, C.V., and T.L. Glass. Glucose Uptake by the Cellulolytic Rumen Anaerobe Bacteroides succinogenes S85. Annual Meeting of the American Society for Microbiology. 1986.